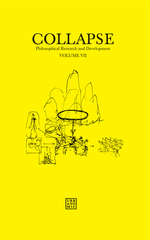 Collapse is an independent, non-affiliated journal of philosophical research and development, launched in 2006. 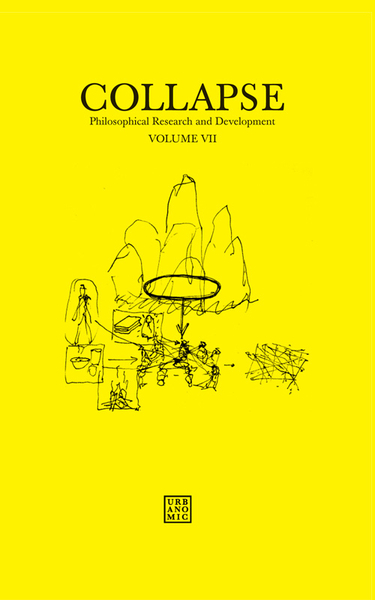 The aim of the journal, which is issued in a limited edition of 1000, is to bring together philosophers and theorists, artists and scientists to explore fundamental themes and ideas which academic philosophy, in its tendency towards specialisation and partisanship, increasingly fails to address. Each volume is carefully curated so that contributions from very different areas of research intersect in unexpected and productive ways, suggesting new lines of thought.